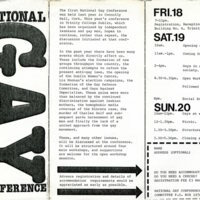 Leaflet for the Second National Gay Conference, held in Trinity College Dublin 18-20 June 1982. This site has a Creative Commons Attribution Non-commercial No-Derivatives License. Please credit Orla Egan, Cork LGBT Archive.